Attachments in Spine are attached to bones via slots. When the bone is transformed, the attachment is also transformed. Some attachments are visual, such as an image, while others are conceptual, such as a bounding box. 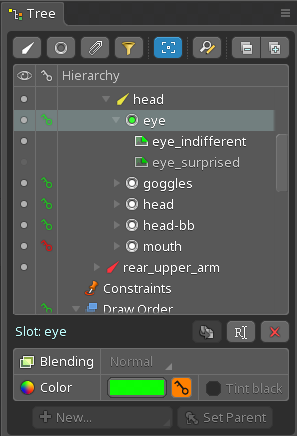 Which attachment is visible for a slot can be changed during an animation by setting an attachment key. Attachments can be organized using skins. When a path is specified in the Image path field, the attachment name won't correspond to the path anymore, but this path will be used instead. Attachments can be turned into meshes by checking Mesh, and vice-versa. Unchecking Select makes an attachment selectable only from the tree hierarchy. When Export is unchecked, the attachment won't be exported unless it is keyed in an animation. These two last settings are particularly useful when using reference images in a project such as a background, or animation sketches. Attachments which use images, such as region and mesh attachments, can be tinted by setting a color in the attachment's properties at the bottom of the tree. This color cannot be changed in animations. To tint an attachment in an animation, the color is set on the slot rather than on the attachment itself. The color is specified in the slot's properties at the bottom of the tree and can be keyed. The slot color view makes setting the slot's color more convenient. Setting the attachment or slot color also allows for setting the alpha (transparency). Setting the alpha to 0 to make an attachment invisible is not an efficient way to hide the attachment. Most game toolkits will spend the same effort drawing an image with 0 alpha as they do drawing an image that can be seen. It is more efficient to hide an attachment by unchecking its visibility dot in the tree. To avoid an abrupt disappearance, the slot color can be used to fade to transparent before hiding the slot's attachment. Tint black enables tinting dark colors separately from the light colors. This allows for effects such as the Super Mario invincibility star flashing, a solid color silhouette, inverted colors, and more. Additional effects can be achieved when using additive, screen, or multiply blend modes. Tint black is enabled by checking Tint Black for a slot, which causes a second color button to appear. The first color button sets the "light" color, which tints the lighter portions of the image and controls opacity. The second color button sets the "dark" color, which tints the darker portions of the image. The original black and white image. Without tint black, the light color set to red. The black and white image is tinted uniformly with red, resulting in shades of the same red. With tint black, the light color set to salmon pink and the dark color to red. The image is not simply shades of the same color, so it has much more visual interest. With tint black, the light color set to blue and the dark color to light blue. Inverse colors, a solid color silhouette, flashing, and other effects can be achieved.